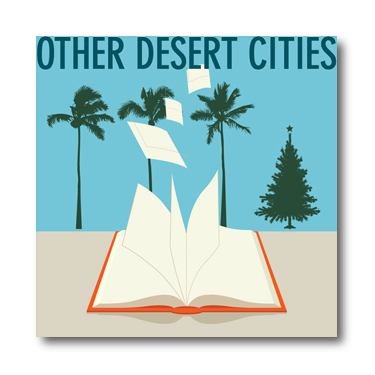 Auditions for “Other Desert Cities“, The Providence Players winter production, will be held on December 1, 3, 4, 2014, at the James Lee Community Center located at 2855 Annandale Rd. Falls Church 22042. Call backs will be held Monday, December 8th by invitation. This is an early “heads up” on the audition dates for “Other Desert Cities“. If you think you would like to audition, please mark the dates on your calendar. The full audition announcement, audition process, character descriptions, production schedule and other information will be posted in the next few days. The “TR” Room is located in the main entrance hallway of the community center to the right of the main desk. The Arts and Crafts Room is located down the hall to the left of the main desk. In this searing comedy-drama, young writer Brooke Wyeth returns home to Palm Springs to celebrate Christmas with her famous and politically-connected parents, brother and aunt. When she announces her plans to publish a tell-it-all memoir of crucial events in the family’s past, she brings to light secrets, intrigue, fear and a surprising twist that even she can’t fathom. This riveting new play was nominated for a 2012 Tony Award for Best Play and was a finalist for the 2012 Pulitzer Prize. The audition process is still being finalized but will most likely consist of readings from the script. You can anticipate being up and down multiple times during the audition in combination with multiple actors, so, if at all possible, please plan on staying for the evening. All 5 roles (2 men and 3 woman) are open. Other Desert Cities will be be performed between March 13, 2015 and March 28, 2014 for 10 performances plus a student/senior preview dress on March 12. Stage rehearsals will begin February 3rd and will be held most weekday evenings (there are some breaks) from 6:30 to 9:45 PM and on weekends during the day. SOME pre-stage rehearsal, read-through and other work may be scheduled in January based on actor availability. As a general rule, to the extent space is available, all auditioners will be allowed to watch all auditions. We try to make our auditions as fun and stress free as possible.